The recently opened “Impression, Fashion and Modernity” special exhibit at the Metropolitan Museum of Art combines my favorite style of art and one of my favorite periods in history, so I couldn’t resist a visit. 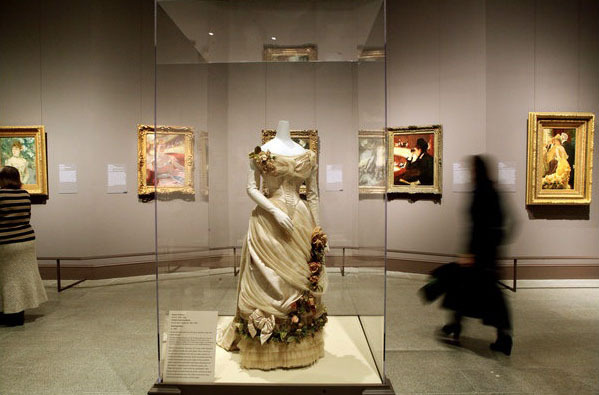 Through a mix of paintings, period costumes, accessories, photographs and prints, the exhibit chronicles the advent of fashion as we know it today. Beginning in the mid-1800s, Paris was buzzing with urban change as the Impressionist movement was coming of age. This modern era was marked by the rise of department stores (such as Printemps in Paris), along with the proliferation of fashion magazines (which often included patterns so women could buy fabric and trimmings and make their own outfits with sewing machines at home), making ready-to-wear fashion accessible to the middle-class for the first time. La mode went hand-in-hand with la modernité, and so Paris emerged as the fashion capital of the world. 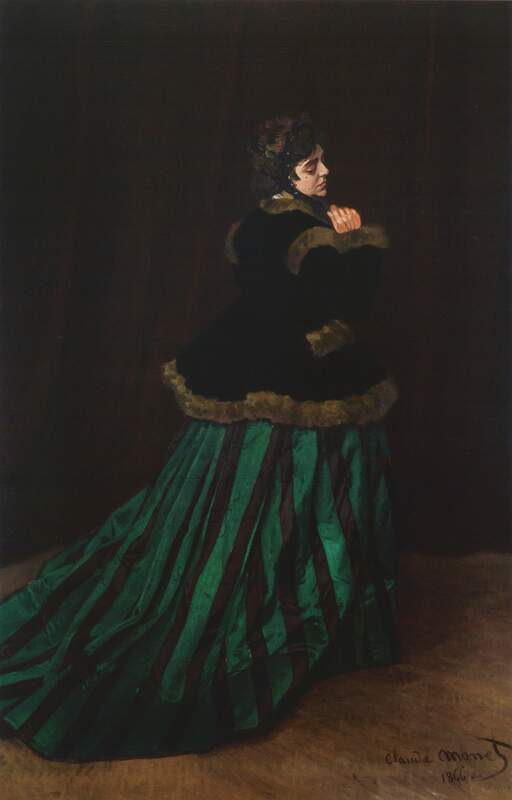 The exhibit opens with a beautiful emerald green and black striped period dress, reminiscent of Monet’s painting Camille. Stripes (which are a major staple in my wardrobe) were a striking sign of contemporary dress in the mid-1800s, and Monet’s intent with the painting was not to create a formal portrait of his wife, but rather to capture the essence of a Parisian of the era. Thanks to aniline chemical dyes, new trendy colors also began to populate fashion. 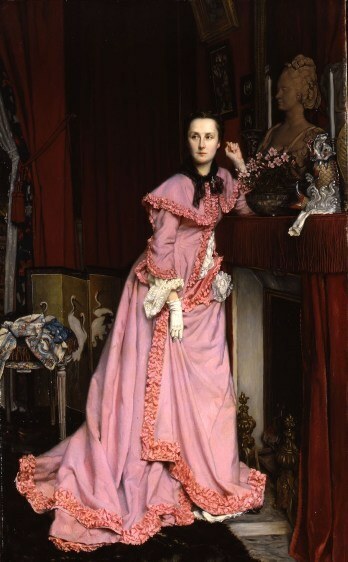 This process was used to achieve the color of the pink velvet housecoat worn by the well-to-do Marquise de Miramon in James Tissot’s painting, which was showcased at the 1867 World Fair. This new colorful dress was also put on display outside of the home with the rise of the steam train, which whisked Parisians to the countryside for “le week-end”, capturing the attention of Impressionist painters. 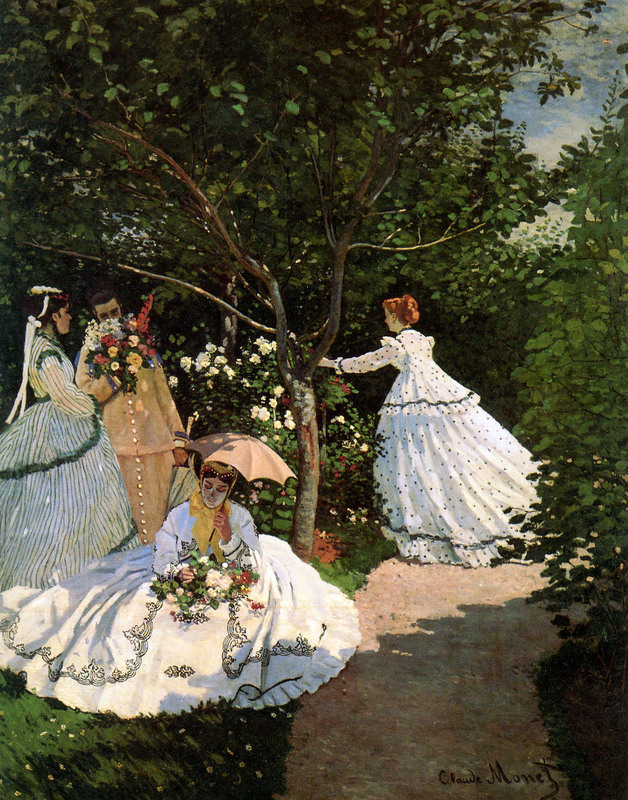 Like a garden party spread in modern-day Vogue, fashion got the en plein air treatment, in paintings like Monet’s Women in the Garden. The artist dug a hole and lowered his canvas to ground level to capture the right perspective of the women, all modeled after his wife Camille, in their fanciful dress. The detailing on the dress of the woman seated demonstrates the Austrian knot, a design technique that was popular on both sides of the pond. Twisted cord or braid was used to create elaborate designs, similar to the embellishment of military uniforms, which was a sign of the times (think Scarlett O’Hara’s blue and black dress in Gone with the Wind). Beyond color, basic black and white were also prevalent in fashion of the 1800s. 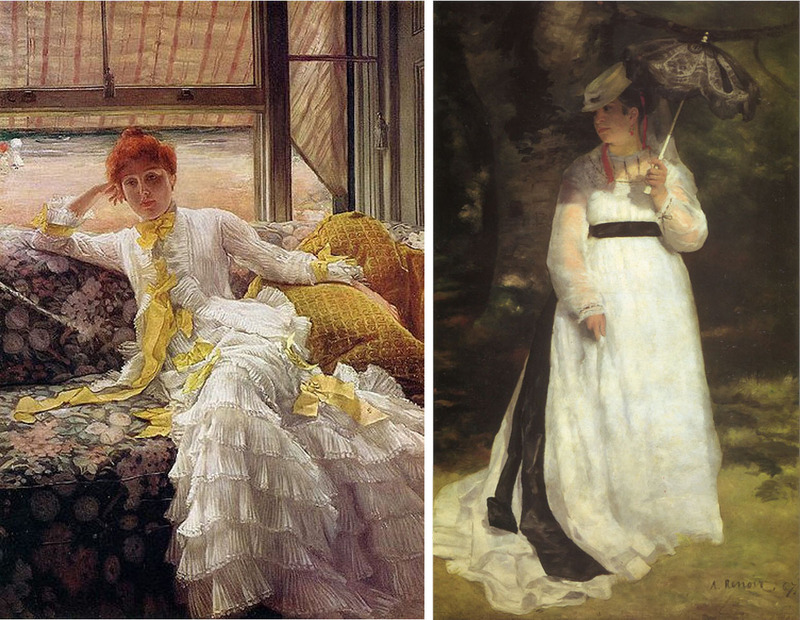 If impressionist art is characterized by its depiction of light, then white was the epitome of impressionist dress. Émile Zola compares white to “the brilliance of light itself” in his novel Au Bonheur des Dame, and the technique of bleached linen helped women achieve an almost ethereal look. By 1860, black had become a sign of urban sophistication and carried a certain cache since the color demanded quality dyes to avoid a green or yellow tint. 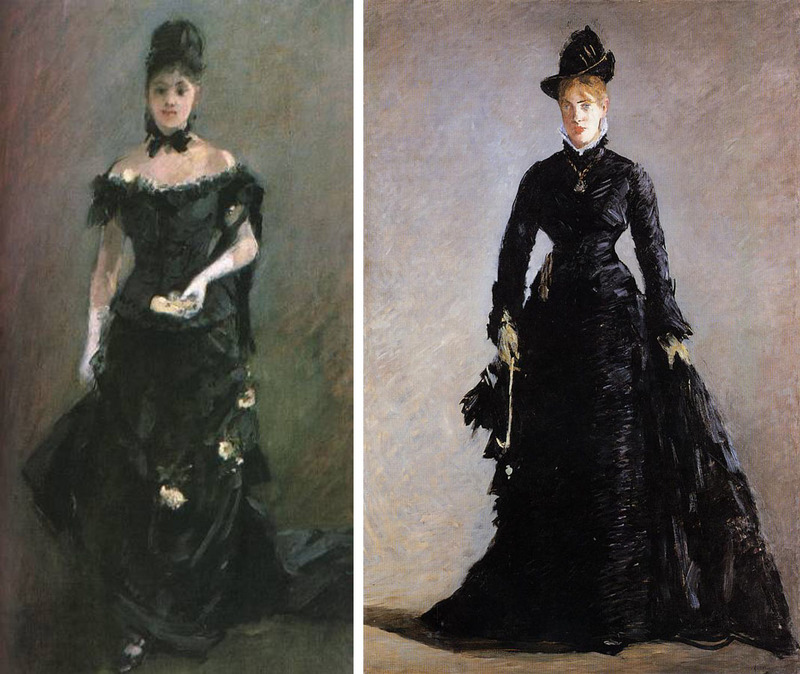 “I’ve been forty years discovering that the queen of all colors is black,” wrote artist Pierre-Auguste Renoir, and so the black dress became all the rage and a common staple in the modern woman’s wardrobe. Enter the LBD. Another indication of status, accessories played a key role in the 1800s. Flamboyant hats, shoes and gloves took center-stage for the well-to-do woman of the era. Shawls made from fabrics like cashmere from India and Persia were highly coveted luxury imports. Also popular were parasols (which were described as given women “new graces” and a “halo” effect), fans, bustles and itty, bitty corsets (ouch!). Also during this time period, designer Charles Frederick Worth made his mark on the Paris fashion scene. After moving to the city in 1846, Worth became known for his use of lavish materials and attention to fit. He created high-quality, one-of-a-kind pieces for important clients including Napoleon III’s wife Empress Eugénie, and earned the title of “father of haute couture.” An example of Worth’s work at the exhibit was a beautiful evening gown, with cascading fabric and rose details, likely worn by a high-society woman to the opera. Men were not left out of the fashion scene of the time, rather the silhouette of a 19th century gentleman was both clear cut and well-cut. There was a sense of “uniformity” with menswear in the 1800s, which consisted of two sets of clothes outside of a dressing gown – daytime suits and evening suits. Men wore straight cut trousers and coats in dark shades and ordinary fabrics, complete with a hat and cane. With Haussmann’s newly-widened boulevards in Paris, fashion was on full display. 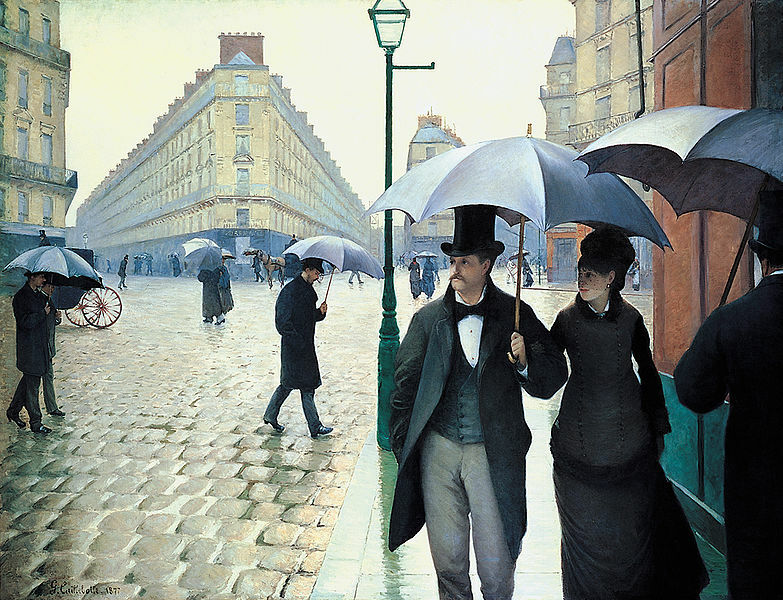 Perhaps the best example of this is Gustave Caillebotte’s Paris Street, Rainy Day, which captures the essence of the era and solidified Paris’ stake as the place to see and be seen. 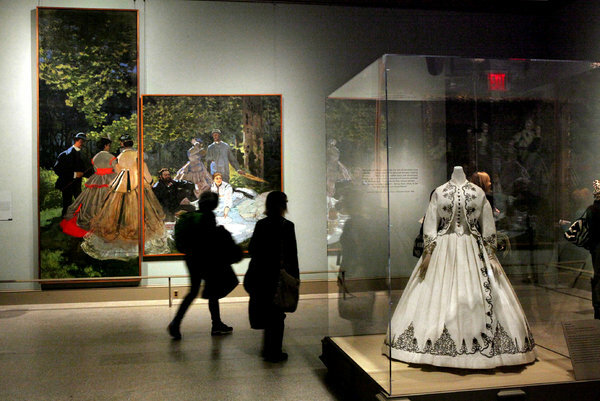 If you go: “Impressionism, Fashion and Modernity” at the Metropolitan Museum of Art through May 27, 2013. Exhibit included in general museum admission. For more information, visit metmuseum.org.